When I moved into my manufactured home community in Murray Utah in 2010, I had a mortgage for my home and the lot rent was $350. Over the next couple years, the rates just kept going up and up and up until lot rent was $500 on top of my mortgage. Then they separated water so it was no longer included in lot rent, and I was told I needed to put in a new sewer line, even though that should have been part of the infrastructure. All together it was too much, it priced me out. I consider it a financial eviction. After I left the lot rents continued to rise, my friends who still live in the community have told me that lot rents are now $594. I loved it there, and when I moved in I figured it would be my permanent residence for the remainder of my life. When I could no longer afford lot rents, I had to sell my home and leave. I got just enough from the sale of my home to get out of my mortgage. But at that point I had nothing left, I had to move in with my sister, I lived with her for a couple years. Then I rented a room in a condo for about a year. I had to leave because the owner decided not to rent the room anymore. From there I moved and rented a room from a woman in a shared apartment. I put down first month, last month and a deposit. When I had barely been there a month, the woman, my new roommate, called the police and said I had threatened her. She was crazy, I hadn’t even said anything to her. But I had to leave the apartment and go to court to fight it. I won, she didn’t even show up, but in the mean time she had an open door to steal my belongings from the apartment. I never got all of my belongings back, or my deposit and the rent I had put down. At that point I had nothing left, and basically became homeless. If it wasn’t for friends and family loaning me money I would have been on the street. I was able to stay with friends for a couple of weeks, and then they pulled together money for a motel room for a couple months, for $1,200/month. I am still paying back that loan. I had put in an application for subsidized housing earlier in the year, but I was on a waiting list. 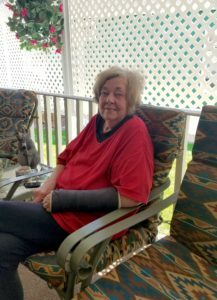 It ended up taking me 11 months on the waiting list before I was able to move into the senior housing, two months after I moved into the motel I was assigned housing. Really, I got lucky, they told me it could be 1-3 years. I just live on social security, $830/month, and they take $104 out for Medicare. If it wasn’t for my friends and my niece who loaned me money for the motel, I don’t know what I would have done. I don’t know what I would have done if I had to stay there more than a couple months. I’ve been a basket case, I’ve lost 50 lbs. through all of this, I have to take anti-depressants, but at least I’m ok. In January of 2017, I was finally able to move into subsidized housing. It’s not my cup of tea, it’s not the lifestyle I pictured passing my golden years in. I’ve always liked to have a garden, but there is not space here. I have a little garden box on my balcony and make do with that. Really, I just have to live with it, I don’t know where else to go, I don’t really have a choice. I don’t have a dishwasher or microwave, and there is laundry in the building, but not in my apartment. It’s nothing serious, it’s just I’m used to having a washer dryer, my whole life I have had them. I’ve never had to cart my laundry somewhere else to wash with a coin operated machine before. It’s just not what I expected for my life at this age. I don’t have a walk out like I did in my manufactured home, and I have to climb stairs here, and you know I’m almost 74 years old. I’m grateful it’s a nice community property, and I’m just trying to bite my tongue and appreciate what I have. There are nice residents where I live and I feel at home, I’m not lonely. I have my own space, my own bathroom, and I’m on my own, but there’s an emergency cord to pull if you fall down and can’t get up so that’s good. It’s a nice facility there’s a little alcove that has some health equipment. I’m grateful I’m ok now, even though it’s been a difficult few years. Still, one of the most terrible things about leaving my manufactured home community was having to leave behind my dear friends. With my life now, I’ll tell you, for me, it’s a pride thing, for me to be go through this and be living like this after what my lifestyle has been. To have to apply for food stamps, and be on Medicaid. I just broke my wrist, if it wasn’t for someone helping me apply for Medicaid, I would not have been able to afford to get it taken care of. I never thought I would end up my life in this kind of situation. I worked all of my life and paid into the system. Being in my financial situation, I get enough food stamps to live on. But to swipe my EBT card at the grocery store that means that I’m desperate for food, it’s really a pride thing. What is most scary about my story is it could happen to anyone, any senior, any manufactured homeowner. If you have to leave from the rent increases, you don’t have many options for where to go, how to survive.